At the Senator Bob Hooper House, we are committed to making sure the highest quality of care and compassion are provided to our residents and their families. Whether it is medical services or supportive care, every member our team plays an important role. Cindy Hushon is the Chair for the Board of Directors at the Senator Bob Hooper House—she is also Bob Hooper’s daughter. Both Cindy’s grandparents and father required hospice care and because she was able to so personally see how profoundly that care helped not only her loved ones, but she and her family too, her perspective on hospice changed. Now for Cindy, hospice care is never about giving up. It’s about learning to accept that death is a natural part of life and how important it is to live every minute to its fullest. While her dad was in hospice care, she and her family had the opportunity to spend time together talking, sharing stories and saying many of the things they needed to say in a warm and comfortable setting that felt like home. That’s one of the reasons Cindy so strongly feels that providing a place that cares for people who are terminally ill and their families is so important. The Senator Bob Hooper House is a beautiful and peaceful home for people who need hospice care, and Cindy is committed to making and keeping it available to everyone in our community. Kristen Gardiner is a Licensed Practical Nurse who has been at the Hooper House since the beginning. 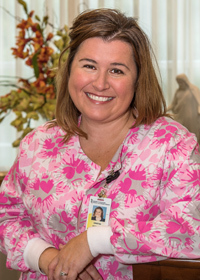 Not only is Kristen a fantastic nurse, she has also worked as an Intake Coordinator, Alternate Assisted Living Manager and currently serves as the home’s Assistant Director. She is certified in both hospice and palliative care. Always impassioned about those she cares for, Kristen knows that providing support to a resident’s family is just as important as the care their loved one receives. Her goal is to consistently ensure exceptional, warm and personal care to every patient. The relationships that form here provide peace and a sense of calm to the residents and their families; but for Kristen, they also confirm for her why what she does and what the Senator Bob Hooper House provides is so important. Shawn McNamara is a Registered Nurse who serves as the Assisted Living Manager and Delegating Nurse for the Hooper House. 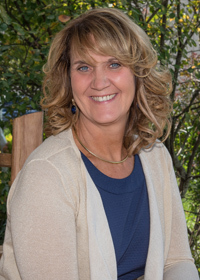 Shawn holds a master’s degree in nursing and a doctoral degree in education. He became involved with hospice care shortly after becoming a nurse over 35 years ago. 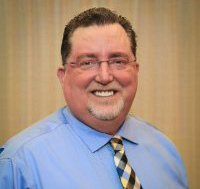 Shawn has held many leadership positions in hospice advocacy organizations. Shawn teaches end of life and palliative care courses to health care professionals with the goal of increasing practitioner’s understanding of palliative care and thus increasing the quality of care provided in our state. 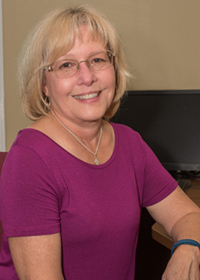 Jane Spicer has been a part of the UM Upper Chesapeake Health family for 20 years. Jane began as an Administrative Assistant in the hospital pharmacies before becoming the Office Manager for Cancer LifeNet. She now calls the Senator Bob Hooper House home as its Hospice Coordinator. Crystal Clark is a Philanthropy Officer for The Upper Chesapeake Health Foundation. 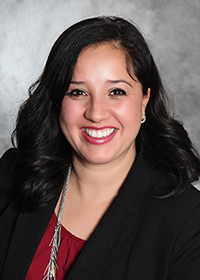 In her role, she works to cultivate relationships with patients, families, physicians and other care providers to fulfill the health care mission of UM Upper Chesapeake Health: maintaining and improving the health of its community by providing the highest quality of care to all. From the funding of innovative health care programs and services to the expansion and improvement of medical equipment and technology, Crystal offers people the opportunity to make meaningful gifts that ensure a healthier community. She is truly committed to supporting our neighbors in need and making sure the Senator Bob Hooper House continues to be a place where hospice care is provided in a compassionate, homelike setting.